W Gato, J Means. Elevated and Prolonged Lead Exposure in Fisher 344 Rats Leads to Marked Hepatic Differentially Expressed Genes. The Internet Journal of Genomics and Proteomics. 2009 Volume 5 Number 2.
: The emergence of DNA chip technology has dramatically increased the number genes that can be studied simultaneously. It has afforded toxicologists the opportunity to study thousands of genes at the same time. Affymetrix DNA Microarray analyses were used to assess hepatic gene expression patterns in Male Fisher 344 rats exposed to 0ppm, 50ppm and 500ppm lead (as acetate). : Total RNA was isolated and used for cDNA synthesis, as a template for T7 polymerase in the synthesis of cRNA molecules. These cRNA molecules were cleaned up, fragmented and hybridized to GeneChip® Rat Expression Array Set 230 (RAE 230A) and subsequently scanned as described in Affymetrix GeneChip™ one-cycle eukaryotic target labeling assay. : The scatterplot data suggest a greater number of genes were differentially expressed in the 90 days 500 ppm Pb2+ treatment than the other dose groups. Interestingly, 90 days 50 ppm treatment showed less than half the number of genes expressed compared to the 30 days treatment. In contrast, the 90 days 500 ppm group had over one thousand genes differentially expressed at 2-fold and more than twice the number of genes of the other treatment groups at 3-, 5-, and 10-fold levels. Gene precursors for proteins such as FBJ murine osteosarcoma viral oncogene homolog, heat shock protein, protein kinase and proliferating cell nuclear antigen were ten fold up/down-regulated. : In summary, effects associated with lead exposure are dose and time dependent. Response to lead poisoning was observed to be almost similar for the short term treatment period irrespective of lead dose levels. However, when the dose levels were low over long periods of time, toxic effects are minimized due to adaptive response over time. On the contrary, lead exposure for long periods of time results in adverse effects in the form of increase incidence of lead-induced gene expression. The importance of lead as an environmental chemical species exhibiting various toxicity symptoms has been well documented. [1-4]. Lead targets diverse organ systems such as the skeletal, hematopoeitic, renal, endocrine and nervous systems , thereby partitioning between soft and hard tissues with approximately 95 % and 70 %, respectively, found in the bones and teeth of adults and children. Bone then serves as a pool to replenish excreted lead from the blood. Some adverse conditions associated with lead poisoning include DNA damage, neurological impairment, abnormal heart function, osteoporosis among others [6-7]. In addition, weakened immune defense system, sterility in male and females, abnormal fetal development, and glycosuria are also associated with chronic lead poison. Lead perturbs the functions of enzymes and proteins of varying types. Studies have shown that, lead exerts its influence physiologically and biochemically as a mimetic agent for essential elements such as calcium, iron and zinc. For instance, it directly interferes with zinc and iron in the biosynthesis of heme, Pb binds to sulfhydryl group protein enzymes and thus interferes with protein synthesis either directly or indirectly [6-7]. Lead binds to different classes of transport proteins including metallothionein, transferin, calmodulin and calcium-ATPase. By associating with these proteins, it is transported to specific target tissues where it causes its damage. Lead transport and assimilation is optimum when there is the deficiency of iron, calcium, or zinc because lead is able to displace these metals during specific physiologic processes . The interaction of lead and calcium alters the proper functioning of calcium channels and ionic pumps. This leads to inadequate energy generation because of mitochondrial damage. Lead also causes defects in protein folding because of its binding to sulfhyryl groups and it can alter the structure of DNA binding motifs by disrupting their conformation . Recently toxicologists have employed molecular tools such as microarrays in the assessment of risk to humans using different animal models. These molecular tools involve the measurement of so-called expression biomarkers. Biomarker levels in an organism can provide evidence of contaminant bioavailability (if organism is still in the natural environment), exposure and also a variety of possible effects. Biomarkers can include such parameters as protein levels or activity in cells or enzyme activity in a specific tissue and more recently, the expression of relevant and specific genes. Until recently, gene expression analysis was limited to the analysis of one gene at a time. The emergence of DNA chip technology has dramatically increased the number of genes that can now be studied simultaneously. Gene chips have afforded toxicologists the opportunity to study thousands of genes at the same time thus enabling them to examine entire metabolic or signaling pathways and associated transcription factors with target genes . The primary objective of this project is to analyze and assess hepatic gene expression patterns in Fisher 344 rat liver exposed to lead (Pb2+) at different doses and over different time periods of exposure using Affymetrix Microarray Analysis. Lead can alter the function or activity of genes. 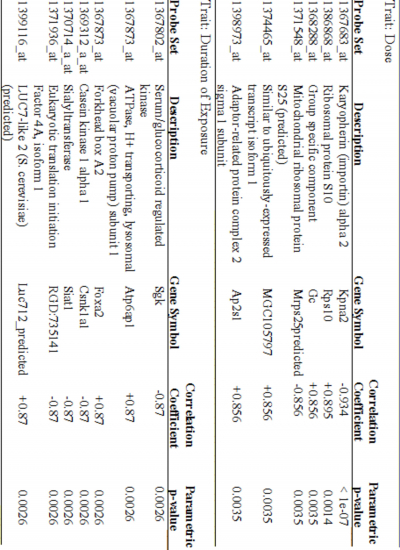 For instance Korashy and El-Kadi  reported the induction of Cyp1a1 gene expression as a response Pb2+ and other metals. This process they attributed to an AhR-dependent process via transcriptional and post-translational mechanisms. Other workers attribute the dysregulation of genes by lead to feedback mechanisms involving interference of Pb with calcium-binding proteins or perturbation of the activity of protein kinase C (PKC) which in turn alters the transcriptional regulation of mRNA transcripts regulated by PKC [12-13]. Gene expression analysis of a specific gene provides an estimate of the number of mRNA molecules obtained from DNA transcription of that particular gene in response to a stimulus. The assay process involves mRNA isolation from an organism’s tissues, and the mRNA transcripts are then converted to labeled polynucleotides which are placed on microarraysand hybridized with the complimentary sequence tags on the chip. Affymetrix Microarray employs a high-density oligonucleotide arrays that are fabricated using in-silico synthesis of short oligonucleotide sequences on small glass chip by light-directed synthesis. Represented on the chip are known genes or potentially expressed sequences of 11-20 unique oligomeric probes which are 25 bases in length for each gene at different loci on the chip. The target sequence is a group of probes that correspond to a given gene or small group of highly similar genes. Targets are usually labeled enabling them to bind by hybridization to the probes on arrays with which they share sufficient complementary sequence . Gene chip DNA microarray provides a rapid means of quantifying the level of messenger RNA (mRNA) abundance in a tissue sample. Quantified mRNA content is an indication of gene expression levels because mRNA is directly transcribed from the DNA . DNA microarray or “chip” consists of an orderly arrangement of equidistant microscopic DNA spots that are attached to a solid surface like glass or plastic or silicon chip. This chip is made up of thousand of distinct sequences referred to as “probes” found in defined locations on a grid. Complementary DNAs (cDNAs), oligonucleotides of varying length or genomic sequences that are fluorescently or radioactively labeled is hybridized to corresponding probes that recognize and attach to the solid support [15,16]. Subsequently, an array consisting of thousands of immobilized spots at predetermined grid locations is generated via pins or inkjet technology or in situ photolithographic synthesis of oligonucleotides [15-19]. The basic premise is that, nucleic acids molecules show a highly selective binding to their complementary sequences. As a result, the addition of the “target” (pool of mRNAs in the sample-derived nucleic acid sample) to the chip surface leads to a highly parallel searching and sorting of molecular partners, that is, probes linking with their respective complementary targets and this selection process is made quantitative through the presence of millions of identical probes at each single location on the array. A fluorescent-based detection scheme is then employed to quantify mRNA transcript level. This typically involves the excitation of fluorescent-labeled mRNA molecules with a laser. The fluorescence emission is digitized with a fluorescence scanner and the intensity data is subsequently transferred to a computer-linked database [14-16]. The goal of this study is to analyze the gene expression of Fisher 344 male rat liver due to exposure of Pb2+ by scatterplot. Six weeks post-weaning male rats were given 0 ppm, 50 ppm and 500 ppm Pb2+ as lead acetate for two time points. At the end of each treatment period, gene expression was analyzed as described in Affymetrix GeneChip™ one-cycle eukaryotic target labeling assay. Forty-eight six weeks post-weaning male Fisher 344 rats were exposed to 0 ppm, 50 ppm or 500 ppm of Pb2+ in the form of lead acetate through drinking water ad libitum for 30 or 90 days, respectively. The control drinking water was distilled water. Prior to commencing treatments, the rat diet, control and treatment drinking water were analyzed by ICP-MS for lead contamination and for verification of accurate dose levels. Rats were housed at the Western Michigan University Animal Facility. The animals were treated according to the principles outlined in the NIH Guide for the Care and Use of Laboratory Animals. There were eight rats which were randomly assigned to one of the three treatment groups. At the end of each exposure period (30d or 90d), rats were euthanized with CO2 and blood was collected by cardiac puncture for serum analysis using ICP-MS. Livers were excised and snap frozen in liquid Nitrogen. Total RNA was isolated from rat livers using a Qiagen RNA Isolation kits for subsequent cDNA syntheses. To determine lead levels in blood, liver, kidney and marrow, an elemental analysis were carried out by Inductively-Coupled Plasma Mass Spectrometry (ICP-MS). Approximately 1 g each of blood, liver, kidney and marrow was weighed into Teflon carousels containing 10 ml of 50 % nitric acid (ultra trace purity) and digested at high pressure in a microwave oven. After digestion, the samples were transferred to 50 mL conical tubes and diluted with 3 % nitric acid to the 50 mL mark. They were further diluted in a ratio of 1:10, 3 % nitric acid for final analysis. A 10 µL Yttrium internal standard (10 ug/mL) was added to each sample just prior to inductively-coupled plasma mass spectrometry analysis. There were three replicates for each treatment and each sample was analyzed in triplicate. Total RNA was isolated from rat livers using a Qiagen RNA Isolation kit . Between 0.05 – 1g liver samples were homogenized in RLT buffer. RLT buffer denatures and inactivates RNases. The RNA is then allowed to bind to a silica-gel membrane and finally eluted with RNase-free water. Total RNA was quantified using the UV-vis spectrophotometer at 260 and 280 nm absorbance and control eletrophoretic gels were run for RNA quality assurance purposes. Double stranded cDNA was synthesized from total RNA samples using reverse transcriptase and oligo dT primer. Then, this synthesized cDNA served as a template for T7 polymerase in an in vitro transcription (IVT) reaction in which amplified and biotin labeled antisense cRNA molecules were produced. These cRNA molecules were purified, fragmented and hybridized to GeneChip® Rat Expression Array Set 230 (RAE 230A) and subsequently scanned as described in Affymetrix GeneChip™ one-cycle eukaryotic target labeling assay . The RAE 230A chip contains over 30,000 transcripts and variants representing more than 28,000 rat genes which were sensed by the instrument and incorporated into the data. It consists of 31,042 probe sets with probe pairs of 11 and 25-mer oligonucleotide probe length. 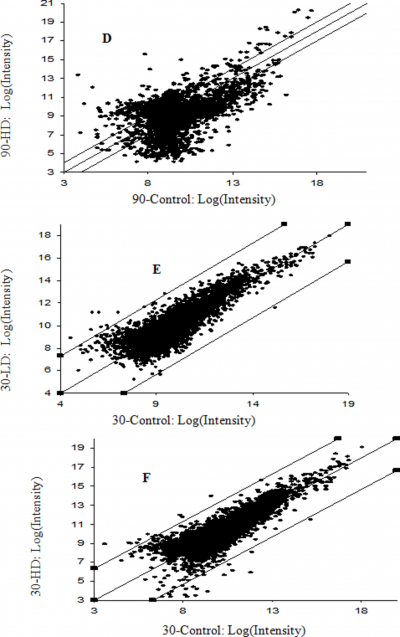 Significant differences in lead levels in tissues as well as morphometric parameters such as body weight and organ weights were analyzed by student t-test and ANOVA. The Affymetrix microarray suite (MAS) software was used analyze the image data (.dat files) for computation of single intensity values for every probe locus on the arrays, and saved as .cel files. The fluorescence intensity due to proper hybridization of each target was estimated by examining the difference in fluorescence intensities in perfect match and mismatch probe pairs present at each locus on the chip. Then, intensities were scaled for all valid probes using a default target signal threshold of 500 units resulting in CHP data. These were saved as EXCEL files and imported into Biometric Research Branch – Array Tools (BRB-ArrayTools) software  for data collation, filtering, normalization and gene sub-setting. Genes which passed through the above quality assurance process were then analyzed for differential expression by scatter-plot analysis. Data collation involved importing data and aligning genes. BRB-ArrayTools converts either EXCEL or CHP files into a tab-delimited format. Individual arrays were filtered using spot filters. Spots on arrays which had signal intensities less than 10 were considered below a threshold and not analyzed further. A log base 2 transformation was applied to all data and each array was normalized to a reference array such that log-intensity differences between any experimental array and the reference array equaled zero over all the genes on the array. The reference was chosen to be the median array. Minimum gene fold-change filter was used to exclude probe sets from all arrays which did not meet the following criteria: the minimum fold change less than 20 % of expression data values at least a 1.5-fold change in either direction from the gene’s median value. Over 2300 genes met these criteria and thus were used in our subsequent analysis of differential gene expression and gene expression profiling. A scatterplot refers to a plot of a summary of sets of variables usually an x and y and occasional z axes. According to Friendly and Denis , it is versatile, polymorphic and very useful statistical graphics. Greenland  notes the usefulness this way “a scatterplot is an objective summarization if data are uncensored” though he suggests the analyst is often subjective in drawing inferences from patterns. Scatterplot as a normalization technique has been employed in microarray data analysis. This technique uses locally weighted scatterplot smoothing (LOWESS) algorithm. 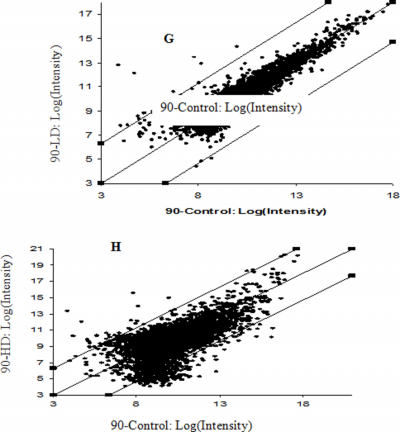 LOWESS, a nonlinear correction technique utilizes a locally weighted polynomial regression of the scatterplot intensity to arrive at a calibration factor. The method is thus more robust than other techniques such as house-keeping based normalization or dye-swap experiments . To validate gene expression data from microarray experiments, quantitative real-time polymerase chain reaction (qRT-PCR) was employed to quantify the mRNA expression of seven selected genes and a control gene β-Actin. Using the National Center for Biotechnology Information (NCBI) database, the FASTA mRNA sequence of β-Actin, calm1, calm2, Alas1, Atp5o, Ppp3ca, Cyp3a13 and Mapk1 were obtained for Rattus norvegicus and employed in the Taqman® Assay-on-DemandTM system provided by Applied Biosystems , thus offering us optimized probe and primer in a single tube. Synthesized cDNA from total RNA as described in Taqman® Gold RT-PCR kit  was diluted to different three concentrations each with three replicates per concentration assayed and loaded together with Taqman® Universal PCR Master Mix and the optimized probe and primer in the form of Taqman® Gene Expression Assay Mix in a 25 μL volume and run on ABI Prism® 7700. 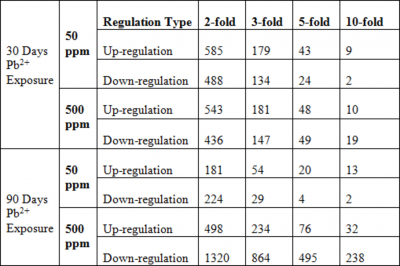 PCR temperature cycling conditions were 95 oC for 10 minutes DNA polymerase activation, followed by 40 cycles of 15s at 95 oC and 1 minute at 60 oC for denaturation and annealing, respectively. 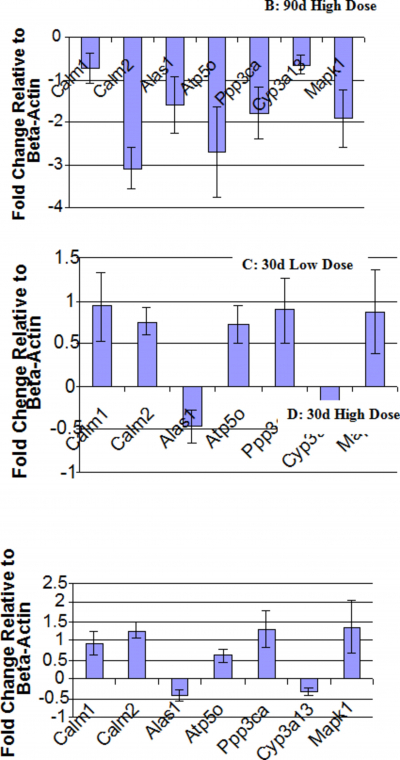 Expressions of genes relative to β-Actin were conducted by REST. Pfaffl and co-workers  report that such relative expression is increasingly employed in analyzing the expression of target genes after standardizing to a non-regulated reference gene(s). This statistical model employs a pair-wise fixed reallocation randomization test. Normalized gene expression values were calculated according to the equation as implemented in REST©. Where E is PCR efficiencies, CP is threshold cycle and ∆ is the difference of unknown sample verses a control. Selected measurements of animal health at time of sacrifice are reported in Table 1. Body weight gains as well as absolute liver and kidney weights were not significantly altered in both the 30-day and 90-day treatment groups relative to controls. The amount food consumed (gram) per gram of body weight gain was also not found to be significant. However, some significant differences were observed for the hepatosomatic and renal somatic indexes (organ wt./body wt.) in both the 30 and 90 days exposure period groups . In the 30-day treated rats, liver and kidney weights and the renal somatic index were decreased. In contrast, in the 90-day treated rats, liver weights, hepatosomatic and renal somatic indices respectively increased 8 %, 11 % and 5 % relative to controls. In Table 2, lead accumulation in blood, liver, kidney and bone marrow were all increased significantly in lead exposed groups relative to the control groups. With the exception of kidney, the 90-day treatment groups also showed markedly higher levels of lead in blood, liver and marrow than the 30-day treatment groups. The amount of lead accumulated in blood was between 6-15-fold greater in the 90-day treated than the 30-day exposed group. This trend is similar to what was observed in the liver and bone marrow. In the kidney, it is a ratio of one-to-one. Figure 1 shows all of the greater than 2-fold differentially expressed genes of rats exposed to lead through drinking water. Figure 1A, E and B, F present the data for rat livers treated with 50 and 500 ppm Pb2+, respectively for 30 days, whereas 9C, G and D, H represent data for rat livers that were exposed to 50 and 500 ppm Pb2+, respectively for 90 days. Differentially expressed genes are those falling outside (above or below) of the pair of marker lines. These genes indicate expression ratios greater than 2- and 10-fold difference. 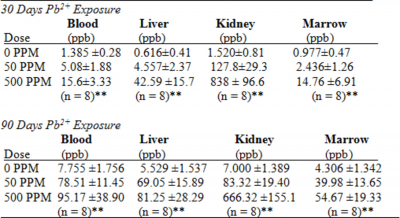 Figure 1: Genes expressed in the liver of Fisher 344 rats exposed to lead through drinking water for 30 days (A) 50 ppm Pb, (B) 500 ppm Pb or for 90 days (C) 50 ppm Pb, (D) 500 ppm Pb at two-fold change and (E) 50 ppm Pb, (F) 500 ppm Pb or for 90 days (G) 50 ppm Pb, (H) 500 ppm Pb at ten-fold change. 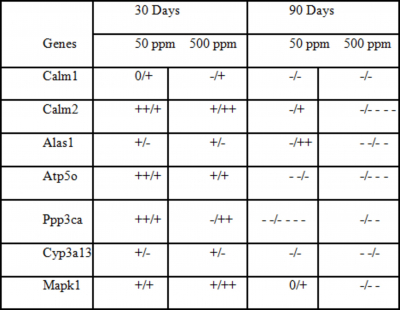 The differential gene expression in Fisher 344 rat liver exposed to varied concentrations of lead for both 30 and 90 days are shown in Table 3. At 2-fold expression difference, the number of genes either up/down-regulated appear to be similar for both treatments during the 30-day exposure period. Surprisingly, the 90-day, 50ppm treatment showed less than half the number of differentially expressed genes as compared to the 30-day treatment. In contrast, the 90-day 500ppm group exhibited over one thousand genes that were differentially expressed at 2-fold threshold level and more than twice the number of genes as the other treatment groups at the 3-, 5-, or 10-fold threshold levels. About 8 % of total transcripts after filtering and gene sub-setting were changed by ten-fold either by up or down regulation (Table 4). 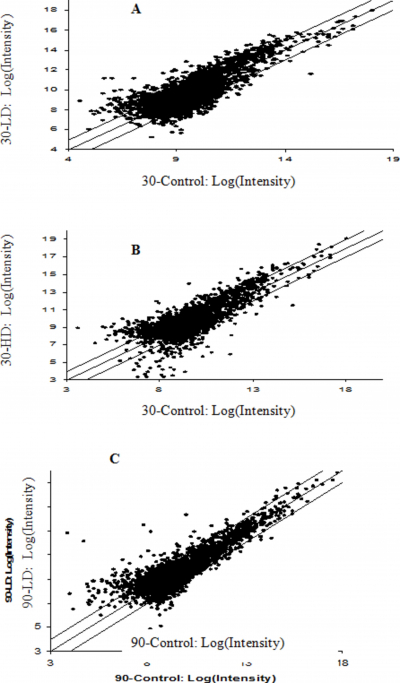 In order to identify genes that were significantly correlated to such quantitative experimental parameters as dose levels and length of exposure, a Spearman Correlation Univariate Test was conducted. In the test a measure of correlation and parametric p-values were calculated by employing Spearman correlation coefficients . These results are presented in Table 5. In the Spearman Correlation Univariate Test at least ten genes were shown to correlate with either length of exposure period or with dose levels with p-values less than 0.01. Some of these genes include Sgk, Atp6ap1, Foxa2, Kpna2, Rps10, Gc and Ap2s1 and these genes are involved in such gene ontology processes as sodium ion transport, apoptosis, protein amino acid phosphorylation, regulation of transcription, protein binding, protein transporter activity and vitamin D metabolism. For those gene transcripts that correlated with treatment duration, correlation coefficients were either +0.87 or -0.87. The dose level correlated group of genes had correlation coefficients of -0.934, -0.856, +0.895 and +0.856. In order to validate gene expression data obtained by the Affymetrix Microarray assays, we used Taqman RT-qPCR to quantify the expression of nine selected genes that are crucial in studying potential lead toxicological effects. The selected genes were: calmodulin, aminolevulinate synthase, ATP synthase, H+-transporting, mitochondrial F1 complex-O subunit, Protein phosphatase-3 (catalytic subunit alpha isoform), Cytochrome P4503A13, Mitogen activated protein kinase-1, Insulin-like growth factor-1 and Pyruvate dehydrogenase kinase-1. 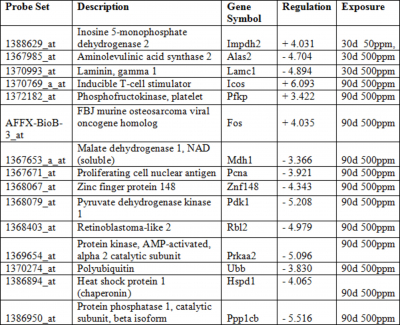 The gene expression levels of these genes as determined from Affymetrix Microarray are re-shown in Table 6. Most of the transcripts in the 30d exposure group were up-regulated while most in the 90d treatment were down-regulated. Calm1, Calm2, Atp5o, Ppp3ca and Mapk1 were all up-regulated in the short treatment regime. Figure 2: Expression of genes determined by QRT-PCR exposed to (A) 90d 50 ppm, (B) 90d 500 ppm, (C) 30d 50 ppm and (D) 30d 500 ppm. For the chronic exposure group, Calm1, Calm2, Atp5o, Ppp3ca, Mapk1 were all down-regulated except Calm2 in the 50 ppm treatment group. Similarly, Alas1 was negatively regulated in all treatment groups except the 90d 50 ppm group. Cyp3a13 was negatively regulated in all treatment groups during all time points. The relative comparison of gene transcripts analyzed by microarray gene chips and qPCR are shown in Table 7. Most of the mRNA transcripts favorably compare between the two analytical methods although the magnitude of expression varies. Comparison of transcripts determined by both Microarray Gene Chips and quantitative PCR. The first column indicates gene expression by microarray while the second shows the relative expression of genes evaluated by QPCR. The advent of microarray technology has offered molecular biologists and geneticists, toxicologists among others, the opportunity assess several thousands of genes simultaneously. This technology has been employed in studying molecular phenotyping, functional genomics, pharmacogenomics, developmental biology and DNA sequencing and mutational analyses . Since lead is known to cause a broad range of adverse effects upon exposure, this method was adopted in assessing the differential gene expression profiles of Fisher 344 male rat liver due to lead intoxication at different dose levels and over different exposure periods. In the process, it has been possible to outline some pathways that are likely to be affected and thus are important in the continuing study of lead toxicity. The data scatter-plots of gene expression values with reference to controls and the subsequent follow-up tables reveal that, about 42 % of all genes were up-regulated at 2-fold change. Approximately 8 % of these genes were either up- or down-regulated at 10-fold. For the short-term treatment period, both low- and high-dose groups showed a gene expression in approximately 1:1 ratio for 2-, 3-, 5-, and 10-fold changes, except the 5- and 10-fold down-regulation values. In contrast, the long-term exposed group revealed a more pronounced pattern gene expression alteration in the high-dose group than in the low-dose group. The ratio of high- to low-dose for 2-, 3-, 5- and 10-fold up-regulation were 2.75:1, 4.33:1, 3.8:1 and 2.46:1, respectively. Those for down-regulation were 5.89:1, 29.8:1, 123.75:1 and 119:1 correspondingly. Comparing the 90-day treatment period to the 30-day period for the 50 ppm Pb2+ group, between one-half and one-third more transcripts were either 2-, 3-, and 5-fold up-regulated at 30 days than at 90 days exposure period. Similar trends were observed for down-regulated gene expression values. Interestingly, the 500 ppm Pb2+ group showed a different result between the time points. Chronically exposed rat groups exhibited 47 %, 56 %, 61 % and 71 % of transcripts up-regulated either 2-, 3-, 5-, and 10-fold, respectively. Similarly, 75 %, 85 %, 90 % and 93 % of genes between 30- and 90-day treatment period were either 2-, 3-, 5- and 10-fold down-regulated as a result of chronic lead intoxication. These results are quite different from those reported by Bouton et al  in their study of gene expression of lead exposed in rat astrocytes in which Clontech microarrays were employed. Of the 418 genes detected in their array, 94 passed the set criteria (ratio expression value ≥ 1.8 and t-test value of p<0.05). Eighty (85 %) were up-regulated and 14 (15 %) down-regulated. Genes already known to be strong targets for lead exposure were observed to be differentially expressed in this study. Some of these are aminolevulinic acid synthase (Alas1, 2), FBJ murine osteosarcoma viral oncogene homolog (fos), heat shock protein 1 (hspd1), zinc finger protein 148 (Znf148) and protein kinase, AMP-activated, alpha 2 catalytic subunit (prkaa2), vascular endothelial growth factor A (Vegf), zinc finger protein 189 (predicted) (Znf189_predicted) and mitogen activated protein kinase 14 (Mapk14) [26, 27, 28, 29]. According to the literature [26-29], these effects are achieved through the perturbation of PKC activity by lead, the binding of lead to zinc-finger nucleotide binding proteins or inhibition of ALA dehydratase. This study also revealed other equally important genes that are likely to be affected by lead. Examples of these genes are: proliferating cell nuclear antigen (PCNA), Caspase (Casp 3), solute carrier family 25, member 30 (Slc25a30), ATPase inhibitor (Atpi), polyubiquitin (Ubb) and protein phosphatase 1, catalytic subunit, beta isoform (Ppp1cb), GATA binding protein 4 (Gata4), insulin-like growth factor 1 (Igf1), Forkhead box A2 (Foxa2), Karyopherin (importin) alpha 2 (Kpna2), Adaptor-related protein complex 2 sigma 1 subunit (Ap2s1), eukaryotic translation initiation factor 4E (Eif4e), tyrosine 3-monooxygenase/tryptophan 5-monooxygenase activation protein, eta polypeptide (Ywhah), protein phosphatase 3, catalytic subunit alpha isoform (Ppp3ca) and calcineurin binding protein 1 (cabin1). Gene Ontology is useful in organizing differential gene expression information into biological processes, molecular function and cellular components. Results are implemented as GO categories in the form of tables and pathways (KEGG) which correlated to groups of genes . GO analysis using quantitative test parameters dose levels and duration of exposure produced different results. Using dose as a reference parameter yielded such genes as karyopherin (importin) alpha 2, ribosomal protein S10, group specific component and adaptor-related protein complex 2 sigma 1 subunit. Similarly, length of exposure as a reference parameter produced gene markers such as serum/glucorticoid regulated kinase, ATPase, H+ transporting, lysosomal (vacuolar proton pump) subunit 1, forkhead box A2, casein kinase 1 alpha 1 and sialyltransferase. Both experimental parameters produced both positive and negative correlations to specific gene expression values due to lead exposure. The results of these series of experiments indicate that exposure time is importance in the assessment of dose-response relationships of lead toxicity. Dose levels are not crucial when the exposure period is short when considered based upon the number of genes affected. If exposure to lead becomes chronic, then dose was observed to become a more relevant factor. Responses to lead intoxication were observed to be similar for the short-term treatment period irrespective of lead dose. However, when the dose levels were low over long periods of time, toxic effects seemed to be minimized possibly due to an adaptive response over time. Williams and Iatropoulos  explain that the hepatic adaptive response could be beneficial if it leads to the enhancing the capacity of all cellular units to respond to chemical induced stress in order to preserve viability. The process involves modulation of the various cellular and extracellular functions of the cell leading towards homeostasis. Adverse effects often result, when the conditions necessary for homeostasis cannot be maintained. This was seen in the chronic treatment groups in this experiment, particularly at the high dose level. Quantitative PCR was employed in validating the microarray results. This approach has been used in practically every microarray experiment for such purposes. Transcripts chosen for validation are involved in processes such as regulation of cell division and differentiation, metabolism and transport of oxygen in vertebrates, cellular energy metabolism, signal transduction, metabolism of pharmacologically, physiologically and toxicologically important agents, transcription regulation, activation of signal transduction pathways involved in the expression of transcriptional regulators of tumorigenesis and glucose metabolism. From our study, gene expression as determined by microarray gene chips and qRT-PCR are comparable although the relative expression values are somewhat different. For example, in the higher dose chronically-exposed group, almost all mRNA transcripts evaluated by qPCR had greater fold-change values relative to the ones determined by Gene Chips. Apart from Calm1 and Mapk1 transcripts measured by gene chips in the 30d/50ppm and 90d/50ppm, respectively, all the mRNA transcripts showed expression levels. Most of the selected gene transcripts in the chronically exposed (90d) rats were down-regulated in the high dose group. The effects were less pronounced for the Calm1 and Cyp3a13 genes than for the others assayed. Chronic low dose exposures to lead yielded a mixture of gene regulation responses. Calm2, Alas1 and Mapk1 were up-regulated in this group while all other genes were slightly down-regulated except for Ppp3ca which was strongly down-regulated. Ppp3ca was actually more strongly down-regulated at the 50 ppm dose than at the 500 ppm dose. In this study, we employed β-actin as an internal control because studies by Jover et al  found that the expression of β-actin is independent of dose or time of treatment lead acetate although dependent on RNA level in liver tissues of mice. In their experiment, they found that the injection of lead acetate results in about 45 % decrease Cyp3a11 mRNA levels after 12 hours. Instead of mRNA expression, other studies have examined the activities and protein levels associated with p38MAPK and calcium-calmodulin-dependent protein kinase II (CAMKII) in the brains of rats or zebra fish due to Pb exposure. The results indicate the phosphorylation of p38MAPK and a decrease in CaMKII levels in exposed rats. Also observed were a 40 % decrease of CaMKII β expression in hippocampal cytosolic fractions with no alterations in CaMKII α protein content [32-33]. In summary, effects associated with lead exposure are dose and time dependent. Response to lead poisoning was observed to be almost similar for the short term treatment period irrespective of lead dose levels. However, when the dose levels were low over long periods of time, toxic effects are minimized due to adaptive response over time. On the contrary, lead exposure for long periods of time results in adverse effects in the form of increase incidence of lead-induced gene expression.